Cables are often sheathed with different materials because they are exposed to many different loads. The sheathing with different banding materials is performed in a banding machine where optoNCDT sensors from Micro-Epsilon are installed. The cables can be banded with Kapton, Teflon, mica, polyester, copper or glass fibre yarn. The uninsulated wire is fed into the banding machine from one side. The banding units consist of a receiver for the banding material which is wound on a roll. The receiver is also called a bobbin. There is a case around the bobbin, also called head, which takes over the guidance of the tape. The wire runs in the centre of this unit. 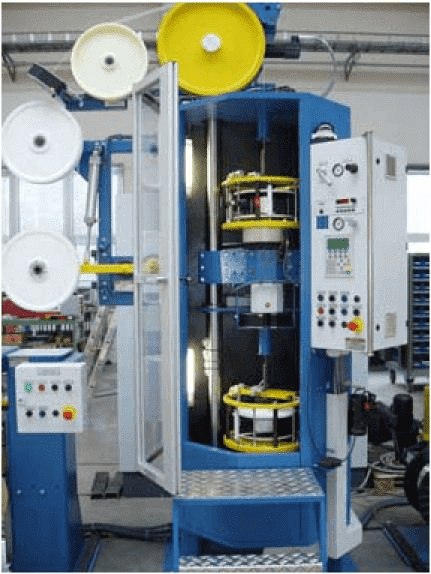 When the wire is moving through the machine, the bobbin and head are constantly rotating in order to band the wire with the inserted material. This is possible because the head and bobbin can rotate separately from each other and therefore achieve different tensile forces and angles. The laser sensor is mounted in the machine next to the drum. It continuously measures the current diameter of the drum from this position. The measurement data obtained are transmitted to a winding processor which calculates the desired torque of the bobbin drive from this. The problem in this application is the different materials ranging from shiny to transparent which can be located on the drum. Shiny metals present a problem for many laser sensors due to the direct reflection. The tapes used have a thickness of about 0.1 mm and are 6 to 8 mm wide. The optoNCDT 1401 with a measuring range of 200 mm competently performs this measurement. The laser spot reflects onto the coil surface and makes a clear statement about the diameter of the coil possible. For the data acquisition, it must be noted that the head has many vertical cross members for the tape guide. 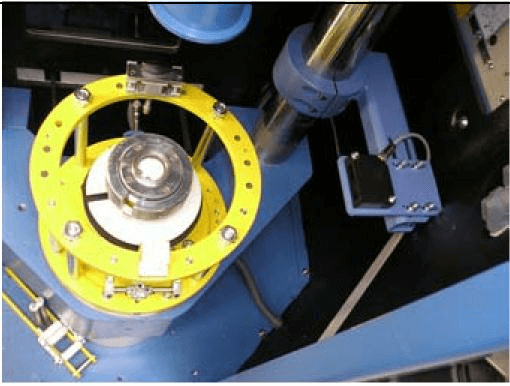 These stays continuously cross the measuring range of the sensor and must be suppressed on the software side so that only the diameter value remains as the measurement result.